You can measure the electrical usage of your household appliances with the Kill-a-Watt kit from National Grid. How it works: Connect the meter to an outlet, then plug a device or appliance into the meter. 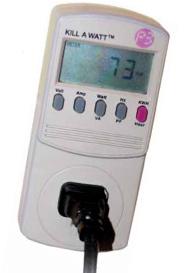 The meter's screen will display how much electricity the device or appliance is using. Try it out on your TV, stereo, computer and other electronics. There's also a booklet with the kit that includes energy conservation tips and information about energy savings rebates and program available through National Grid and Mass Save.